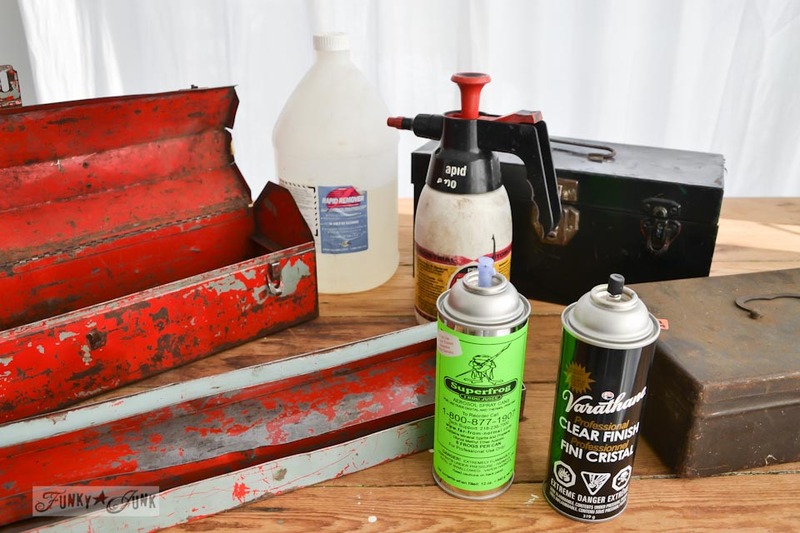 I am a collector of old rusty banged up toolboxes. Like a child may covet cuddly teddy bears, if I spot a toolbox in a pile of rubble, it shall be mine, even if I have to wear hip waders to get it. Not that I’ve ever had to… but by golly I would! So I couldn’t help myself and made an instant junky toolbox charging station with some of my surplus. It will reside beside the old crate phone station in the kitchen. But it was too dark in the kitchen for shots today, so it’s a bright and happy photo studio shoot today. Generally toolboxes come pretty greasy like. What worked really well to cut the grease was a product I had on hand called Rapid Remover. I use it for my sign company for removing old decal adhesive. And boy did it do a great job with grease on metal! It’s smelly to work with, so as long as you use it outdoors, you’re good. As a secondary measure for cleanliness, it’s also nice to hit the metal with a clear spray finish of some sort. I like to try whatever I have in stock, and Varathane Clear Finish won this round. 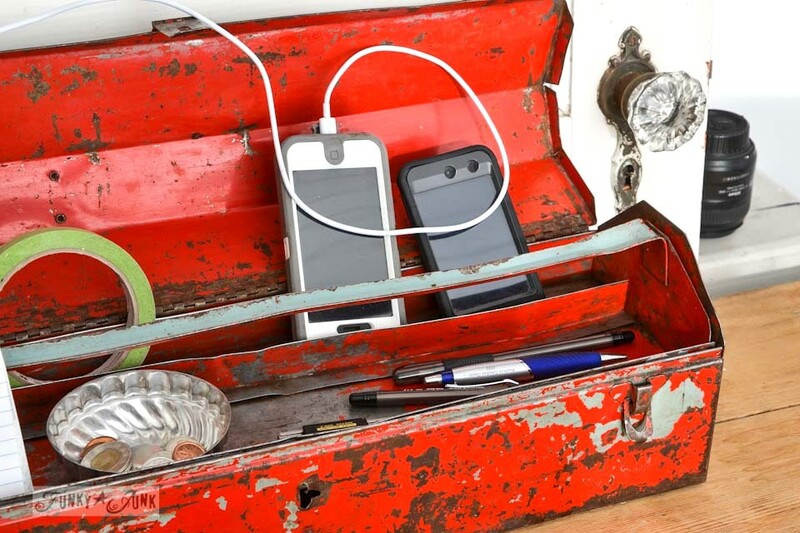 What’s super cool about a toolbox charging station are the two layers. 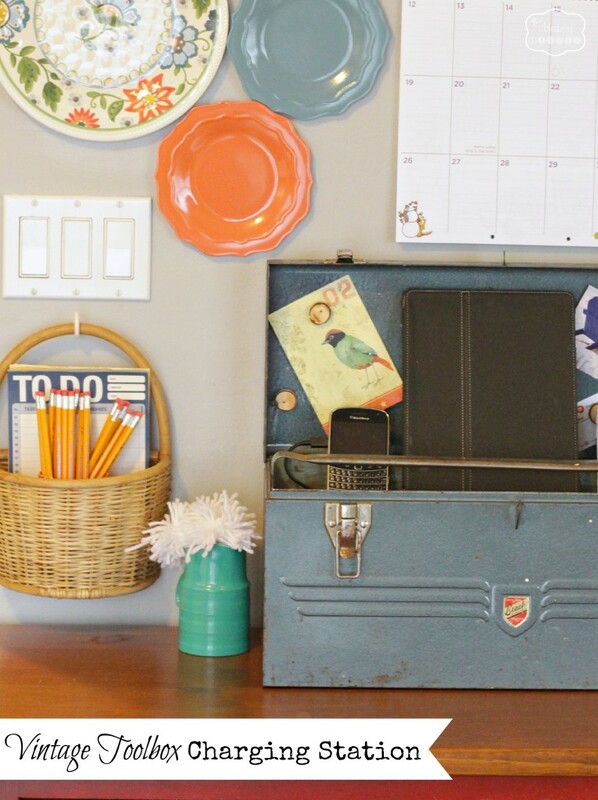 The top tray is easily removed to expose… gasp… hidden paperwork storage! Nice for bills (you’d like to forget). Can we just focus on that fabulous red and green chippy surface for a moment? TRY and emulate that! I will admit this toolbox is a little rough, but in my mind’s eye, if it’s at least clean, I’m happy with it. But one could choose to line the inside with whatever they wish. Normally I would have bypassed showing you this little idea. Sometimes I think my ideas are too simple to blog about, so I push them aside. But… I’m going to make an effort to change my ways. Because sometimes the very simplest things become the coolest..
…such as my old crate toilet paper storage. …or the bathroom cabinet wall gallery. and many of my other projects HERE. So here’s to all the lonely little greasy chippy toolboxes that could becoming charging stations! Do you have one holding tools you could steal that may work? Want to see another one? Krista via The Happy Housie made a toolbox charging station too! Love how she drilled holes in hers for the wires! Brilliant!!! I would put the manuals for the devices underneath. Always know where they are. 😀 Now I’m on the lookout for an old toolbox! You are so clever! That is neat. I just love the creative ideas you come up with. I have a challenge for you. I found this old metal two-drawer index/library card holder that’s about a foot and some change long. I don’t know what to do with it but I know I loved it when I saw it. Inside, there’s a little piece of adjustable metal, one for each drawer, that holds/pushes the cards forward to keep them up front. I thought about using it for recipes, but that means I need to convert EVERY SINGLE ONE to index size. I have four of those! I’ve been keeping them for about 5 years. I would love some ideas on that. I used one of those for medicine bottle organization. A first aide kit could be garnered together too. I do like the idea of a first aid kit! It would be perfect for a stock pile of bandages and ointments on either side. LOVE the recipe card idea, Dee! Why don’t you post a picture of your treasure on my facebook page and share your question with the masses? They love a good challenge! And a visual always rocks for sure. What a great idea! I’m going to bring it in and take some pictures, then I’ll post them on your page. Donna, Again,what a great idea! Please don’t hold back on the simple ideas; those are the ones we can all do with things we have. I love the red chippy paint on this. We could use something like this at my house instead cords all over my kitchen counters. Have a Happy Thanksgiving. Junkers unite…we should be gathering at the metal recycling. It hurts thinking of the creative options which are sent there. I don’t have a webpage or blog, so am sharing here. The guest room is his when home, guests have to put up with it. This room is a reclaim/collection of auto stuff and hand tools once loved. Recently I used 4 old wood handled hand drills as drapery tie backs. And grabbed a metal gasoline price sign (with numbers) for over the bookcase. There is an antique car junkyard I can see from a couple of roads away when driving in the area. Have wanted to photograph rusty and broken glass closeups. You have my curiosity up for finally heading there. Will be interesting if they let me on the property, camera in hand, but also to seek out possible treasures. Thanks to your continuing love of all. Edit to say my guest room was my son’s room. Using hand drills as drapery tie backs?? That’s Brilliant!!! Love this – and guess what?! 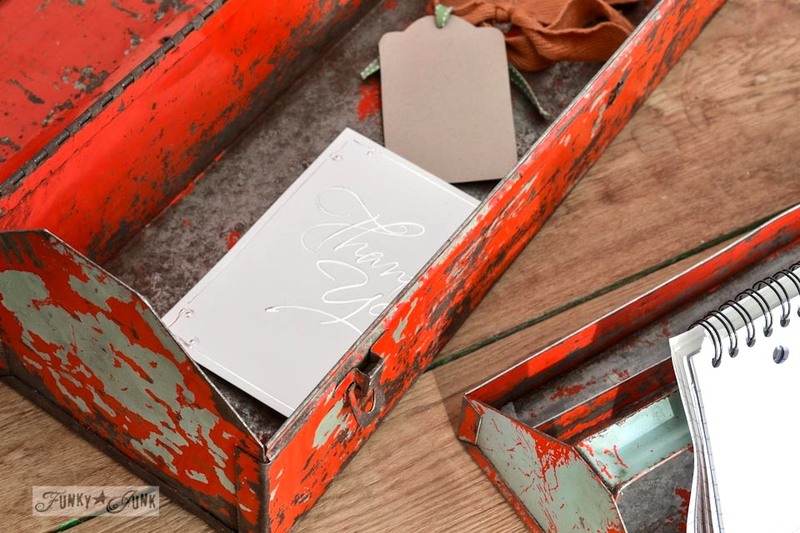 I have a red toolbox that looks almost exactly like yours but more rust! I think I will line the bottom of the box & tray so as not to scratch my phone, etc. I’m thinking brown craft paper, corrugated cardboard or burlap – which would you recommend? There’s no right or wrong answer here, Donna! It’s whatever you love the look and functionality of. If you’d like a little vintage charm, vintage wallpaper or even book pages would also be lovely! Have fun! And I also have some of those aluminum jello molds – love that you use it to hold loose coins! (Aluminum is toxic and I have stopped using it for cooking/eating/buying food). LOVE those little things for so many things. Anything that holds something is always high on my list of must haves when spotted for sure. I love this idea!!! I’ve been wanting a charging station and love this, love this!!! I stumbled upon your blog last week and have devoring each corner of it. You have inspired me not to bury my creative ideas simply because “I’m too busy” or “I don’t have the money”. I love how it hows empowered me and awakened something that has been idle for a while now. Thank you, thank you!!! Now off to dig in my hubby’s stash! Love it! Love the rustic red!!! I came over to check on your projects!!! This makes for a second project I want to copy from you! The first is the luggage turned ottoman that is still on my list! Remember the hydrangea I copied from you last year??? Thanks for the great idea! And yes, the simpler the better! 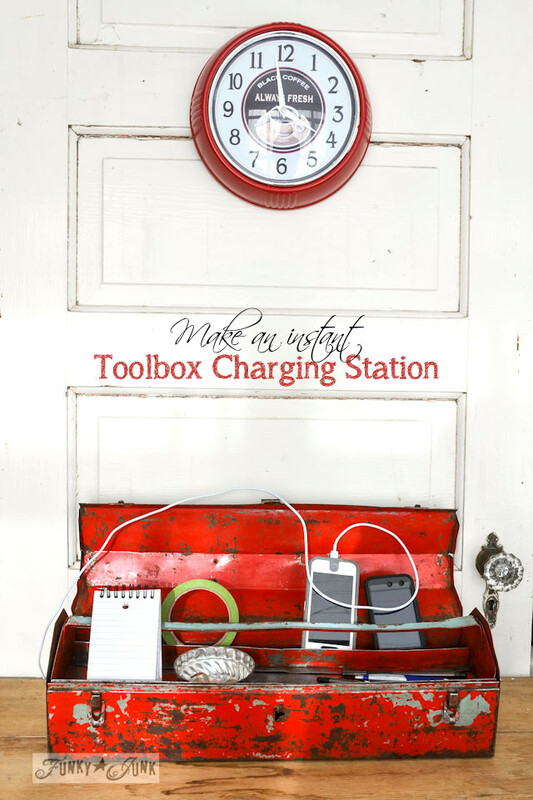 Donna – I LOVE this – I have an old red tool box just like yours that I use in my sons’ shared room to store books… and I had bought my blue one for the same purpose but it was too tall to fit on their bookshelf – glad I got to use it for a charging station instead. Must be something about the water here in BC made me think like you… or maybe I saw it floating around on pinterest and it put a little bug in my brain… I am not sure- and not sure how I missed this great post in November. Must have been in the throws of Christmas crazy!! Thanks so much for your visit to my blog- such an honour:) Have a great rest of the weekend!